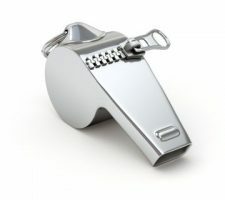 What major changes to CA's whistleblower protection law just kicked in? Here’s why: On January 1, 2014, new laws (AB 263, SB 496, and SB 666) went into effect that fixed major gaps in Labor Code § 1102.5, the California whistleblower protection law. These are gaps that you probably didn’t even know existed. make, adopt, or enforce a rule or policy preventing an employee from disclosing information to a government or law enforcement agency that the employee reasonably believes violates state or federal law or regulation. retaliate against an employee for disclosing information to a government or law enforcement agency that the employee reasonably believes violates a state or federal law or regulation. retaliate against an employee for refusing to participate in an activity that would violate a state or federal law or regulation. The biggest one is that, previously, Labor Code § 1102.5 did not protect employees who made internal whistleblower reports about unlawful conduct! This means that an employee who complained to someone at work that a law was being broken was often left unprotected! So, for example, if a worker was demoted for complaining to management that unsafe products were knowingly being sold to consumers, he would have had no recourse under § 1102.5. In addition, until it was amended, Labor Code § 1102.5 did not prohibit employers from retaliating against or terminating workers who who were suspected of being whistleblowers or who might later disclose unlawful conduct. who have complained about or refuse to engage in violations of local laws, rules, or regulations (in addition to state and federal laws or regulations). from retaliation and unlawful conduct by “any person acting on behalf of the employer,” not just the employer itself. even if the disclosures were part of their job duties (so for example, a safety officer is still protected when speaking out about unsafe conditions). As an employment lawyer who represents workers exclusively, I welcome these changes. Workers are finally protected if they speak up at work about conduct they reasonably believe breaks the law. Not only are they safer, but so are you and I. All Californians stand to gain when workers are allows to blow the whistle on illegal conduct.